We’re moving house again, cue lots of boxes! This is a really positive move for us in lots of ways, but as much as a year ago I said I never wanted to move again… I’m actually relishing the opportunity to pair down my belongings again. I sincerely want to reach the point of enough and no more! This was us before the move last time. 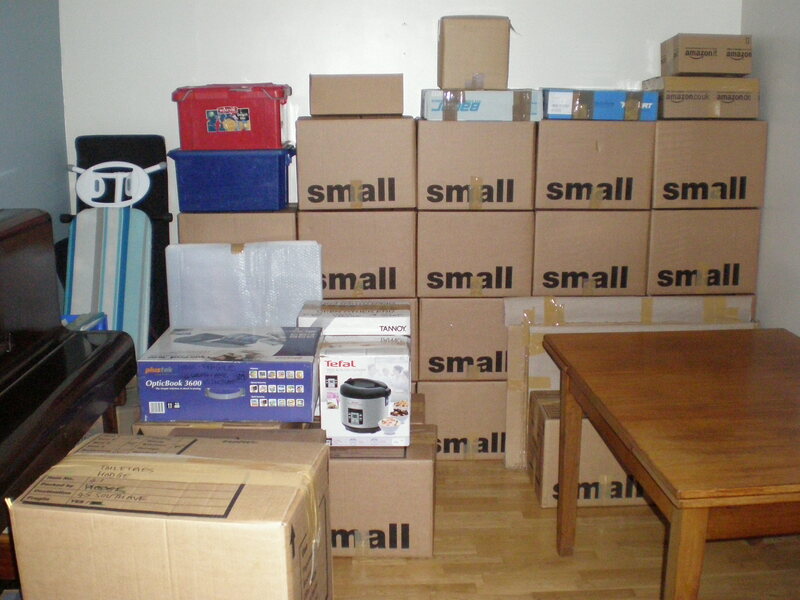 I strongly anticipate having less boxes this time as over the last year, I have continued to purge my belongings. I can see a slow cooker in that picture which I sold. Those big flat pictures behind the table, I gave to a charity shop recently. We have gotten rid of a tonne more books. The only slight problem I anticipate is that we moved from that property into an old family home. The unfortunate results was inheriting all kinds of junk and duplicates. I am hopeful that much of that has gone too, as we have returned items to their rightful owners, sold valuables at antiques auctions and just given shed-loads to charity. So, with my current review- I have offered all the white goods for sale with the property (at a price). I don’t expect them to be taken, but they were all 2nd hand to us and they are such a pain to move. I know we could replace at the other end cheaply. We are selling the dining room chairs we inherited- there are 6- we never use more than 4 except on rare occasions like Christmas. As we are moving nearer family, if more chairs are required- they could easily be borrowed. We hate the way they look to, so why keep something you don’t like?! We will not have a separate dining room in our new house, it’s a lounge-diner- so space is at a premium. Therefore, we only want a max of 4 chairs and we have some that are stackable. Our current dining chairs are not stackable and they are heavy. There will be nowhere in the new house to keep them in the attic, as it’s not big enough. We are also selling a corner dresser we inherited. It is a family heirloom and serves a purpose in our current house because we have an ugly water pipe running up the dining room wall (goodness knows why it was sited there!) But, again we both hate the sight of it- so we are selling it. I have decided to sell my hi-fi system. I’ve been thinking about it for a good 6 months now. With the purchase of an iPod and getting married, I use it about once a month now. My husband doesn’t always share my musical taste and I find I am listening to a lot less music now I’m married. Music just isn’t a priority anymore, something changed- I’m not a teenager anymore! We both have laptops capable of playing music and we could purchase a much smaller iPod dock if we felt the need. I would rather sell it whilst it is only 5 years old and still has some value. I have cleared out my wardrobe and put it all on eBay. I am taking whatever’s left to a car boot sale. I hope to clear the lot! It will give us some much needed wardrobe space and I just plain, don’t need all those clothes! I’m sure there will be more. I plan to shred old documents, sell old magazines at the car boot and go through my craft drawer(s). For his contribution, my husband is getting rid of an old games console (in addition to the one we have already sold!) He is also getting rid of an old laptop and says we can sell the laptop bag at the car boot. Although he would to profess to be a minimalist, it is catching! (In a good way). Has anything prompted you to minimise more? EDIT: Sept 2014- I decided not to sell the hifi for the time being because I suddenly started to use and enjoy it again. Instead, I sold my iPod after I realised that my phone had the exact same capabilities. So I am really happy to have one less device, one that multi-tasks is far more use and I got £75 for it at CEX.